Hope everyone is still enjoying their weekend. It’s been a weekend full of swimming and Birthdays for us and phew it’s getting hot around here! My 13 year old son reads your blog (well more like drools and then prints out recipes for me to make) and he wanted me to write and tell you that A) you have the most awesome cookie recipes ever and B) he wanted to know if you could make a peanut butter marshmallow cookie like a fluffernutter sandwich. So after weeks of bugging me to write you I finally did. We look forward to your next entry. I would have never thought a 13 year old reads my blog, I think it’s great, so here’s a cookie I whipped up for my 13 year old reader. I saw these new peanut butter Whoppers at Walmart a few weeks ago and knew they’d be good. What better way to use them than in a peanut butter cookie sandwich!? They give the cookie a great chewy consistency with a hint of malt flavor. I like these cookies just as they are, but the boys love them as the sandwich with the marshmallow frosting. 1. Preheat oven to 375 degrees F. In a stand or electric mixer, cream the butter, peanut butter, and sugars until creamy. Add egg and vanilla until well combined. 3. Scoop dough with a medium cookie scoop, roll into sugar then place onto a parchment or silpat lined baking sheet. Bake for 8-10 minutes, until cooked but still soft. If this face doesn’t make you smile, I don’t know what will! Have a great day! Aw! Cute! Happy birthday to him! How old is he? I’m not good about guessing age. The cookies look wonderful. That’s cool that you have 13 year old readers. You’re inspiring young ones to cook! These look great. How long should I bake the cookie dough? He turned 3 today. I would be so happy to think I inspire young ones to start cooking! Thanks for catching that error wannabe cook! It wouldn’t be normal for me if I didn’t have to edit my posts! I just fixed it. Thanks! This is just full of “cutenesses”: the 13 years old reader, the b’day boy and the cookies of course. Wish I could try those whoppers! How anyone stays thin around your house I have no idea! 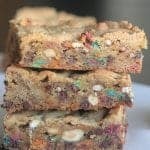 Those look so good and I am a sucker for sweets, every time you post something I want to make it but try and restrain myself, these ones look so fun, I bet your 13 year old fan appreciated your efforts. What a great post! Everyone that reads it will have a great big smile on their face. Cookies look great! Lucky 13 year old reader. I didn’t know they make PB whoppers. Happy Birthday to that adorable son of yours! Happy Birthday to your cute little guy! Those cookies look so good! Gonna add those to my list of things to make from your site! hmmm. i’m thinking you could just slap some marshmallow creme between two of these! how fun! what a great idea the 13 year old had! Oh my gosh…this sounds sooo delicious! I love anything with peanut butter in it! Hey guys, just wanted to say thanks again for babysitting our little “Burry” while were in Cali! I know he’s in good hands w/ his biggest fan Mason watching him! Fun little cookies Snitch! Happy Birthday to your little one. 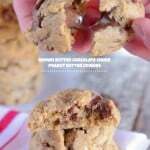 Another yummy cookie recipe-thanks. I’m going to keep my eye out for those whoppers. I literally “Stumbled” on your site. I am so pleased I did. I am a single mommy to very picky eater (my 8 year old) and the human garbage can (my 2 year old). I can’t wait to try and make these with my daughter. I have never seen the whoppers though. Hope they have them in Camden. Be blessed!! What a beautiful family you have. Love the picture. My girls love the reese’s whoppers. I will give these a whirl for sure. Happy Birthday to the funny face three year old (and to his mama!). Those cookies look fantastic – way to go! I’ve got to get away from the sweets this week, hopefully some dinners on the lighter side! Thanks Lisa! I just found those PB whoppers a couple weeks ago, I hope they sell them everywhere, because they are a real treat. I’m thinking brownines next! Yah, Marshmallow cream would be great too! Check your local super walmart sometimes they are right by the registers. Me too sweet and saucy! I hope people aren’t getting tired of my constant PB posts! Anytime really. My boys are loving barry. I caught M whispering to him that he loves him so much! Thanks Prudy, you gotta try those whoppers. So glad you stumbled upon my site. Great to have you here. Hope you’ll find some recipes your family will enjoy! Well, Jenny, after seeing these treats, my eyes have gone into full diabetic coma….I’ll have to go to bed now, and then drag myself to Wal-Mart tomorrow to get those Whoppers so I can put Kurt into a coma too! These look awesome! I would never have thought to put the whoppers in cookies – great idea! those look great! your little boy is adorable! i love your blog too!! I just know you made that 13 yr old fan of yours, one happy young man!!! Wow. I just stumbled across your blog this evening. I’ve got to get cooking and try these! Too bad it’s almost midnight. I’ve never had the pb whoppers, but I love the strawberry ones. And I agree with the 13-year old – you have the best cookie recipes! Peanut Butter Whopper? Woo! That’s awesome! I’ve never heard of peanut butter whoppers. I know that I’d love them though; I love whoppers!! I love these peanut butter whoppers and was trying to come up with a good way to work them into a recipe. I’m so glad you already did! 🙂 I’ll have to try these! Thank you. How cute that you have a 13-year-old fan! I’ve never seen those Whoppers … although I have to admit, the regular ones are one of the few sweets I don’t like … maybe the peanut butter ones would be better. I love your blog. Thank you for putting your recipes out there for us to try!!! I made the Peanut Butter Whopper cookies last night. They were a huge hit at our house. Yummy!